Slide your battle left and right to bounce back the energy ball. Try to break all bricks in every round. 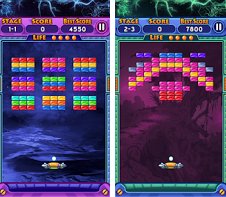 Some bricks need to be hit multiple times to be broken, while some are indestructible, but they don't need to be destroyed to complete the level. You should turn your wifi off before you launch the Smash Brick app. In-case you already open the Smash Brick app, just force close or use the multitask button and swipe it out.